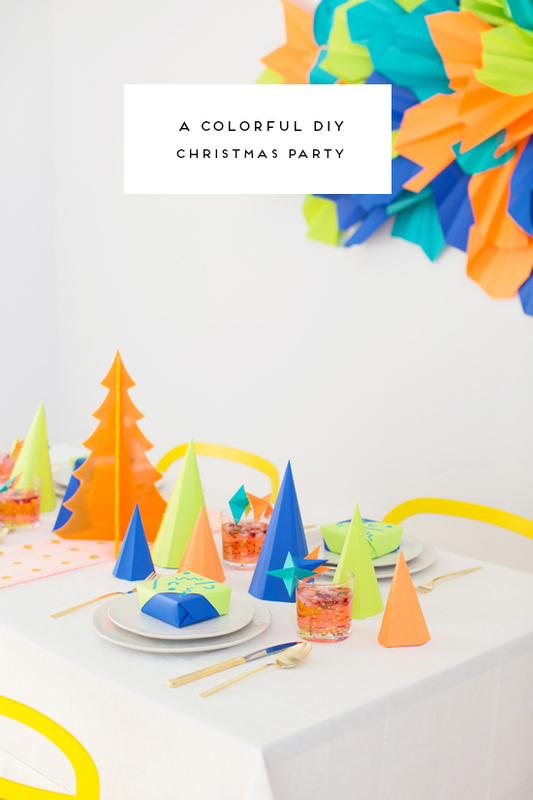 I am ALL about non-traditional color schemes when it comes to the holidays, so when Astrobrights Papers contacted me about colorizing a party with their papers, I knew exactly what I wanted to do… Something that had a Christmas flair to it, but was also modern, fun, and out of the box. 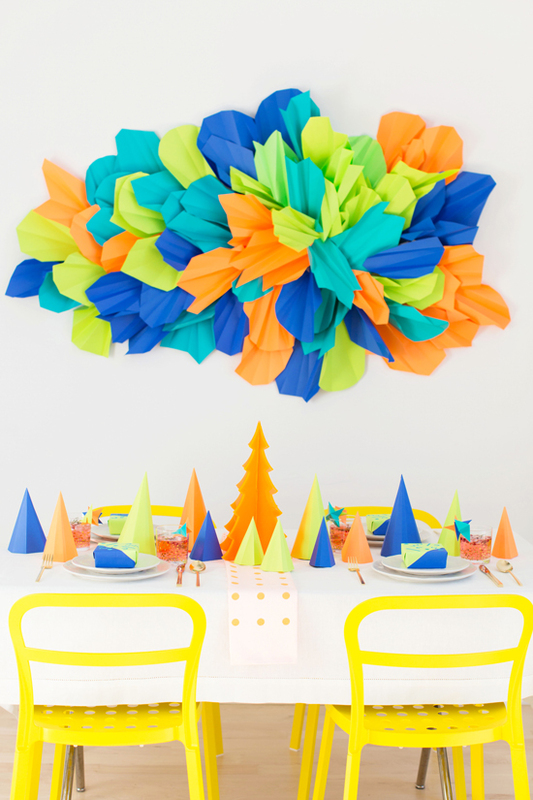 So, I put together this non-traditional Christmas party, filled with DIY projects and crazy colors. 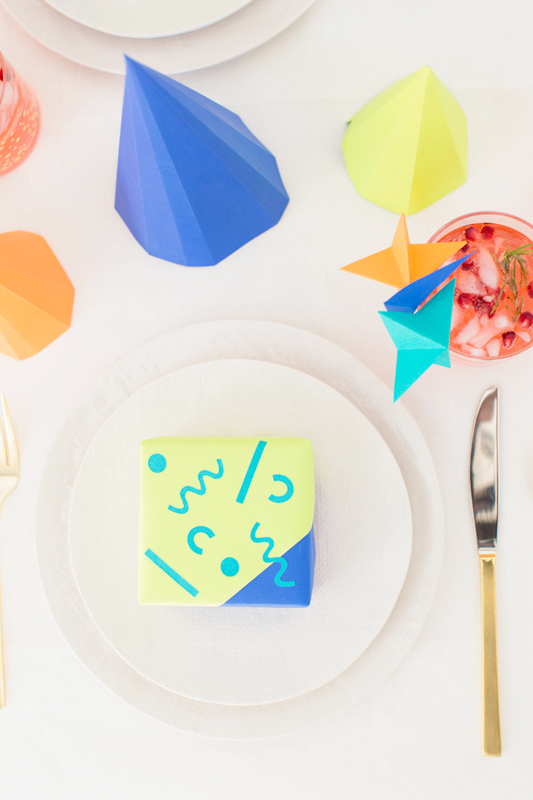 I landed on a color scheme of cobalt, neon orange, turquoise, and neon green and used Astrobrights Papers to execute all of the DIY projects. The official Astrobrights Papers colors I used are as follows, in case you want to recreate this exact look on your own: blast-off blue, cosmic orange, terrestrial teal, and vulcan green. And there are 22 other colors to choose from if none of these tickle your fancy. They have THE best selection of colored papers. 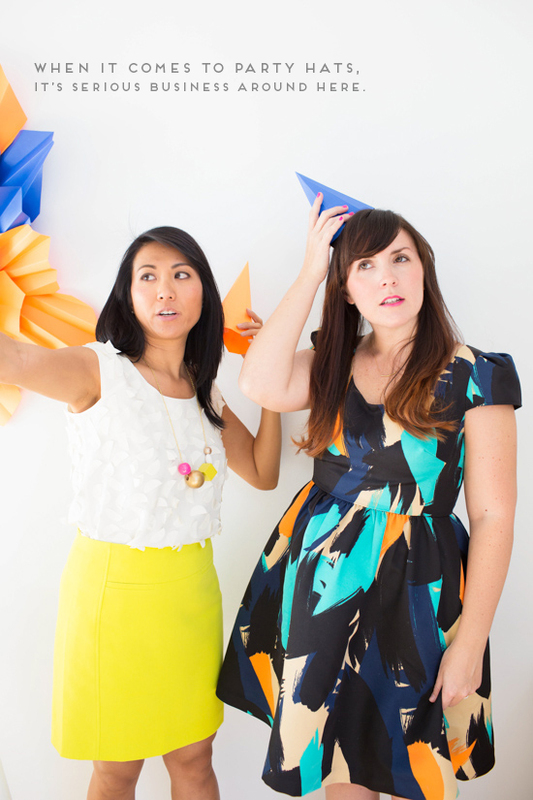 As for the DIYs… I am now head over heels in love with paper projects, after this shoot. They’re fast to recreate, easy to experiment with, and super versatile. Bonus points for the fact that it’s way cheaper to use paper, for DIYs, than pretty much any other supply you can think of. So basically, expect more paper projects from me in the future. Haha. 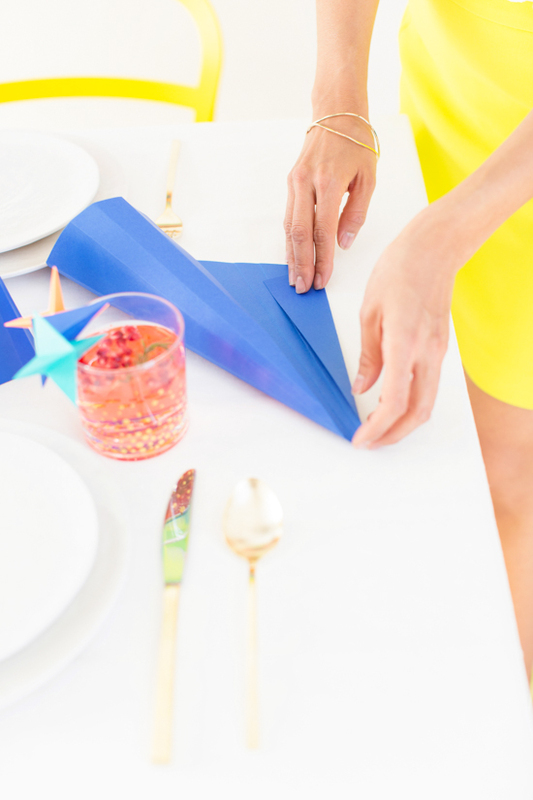 To create any of the DIY projects below, you’ll just need tape and scissors. And if you don’t have these 2 supplies at home, we can no longer be friends. JK. 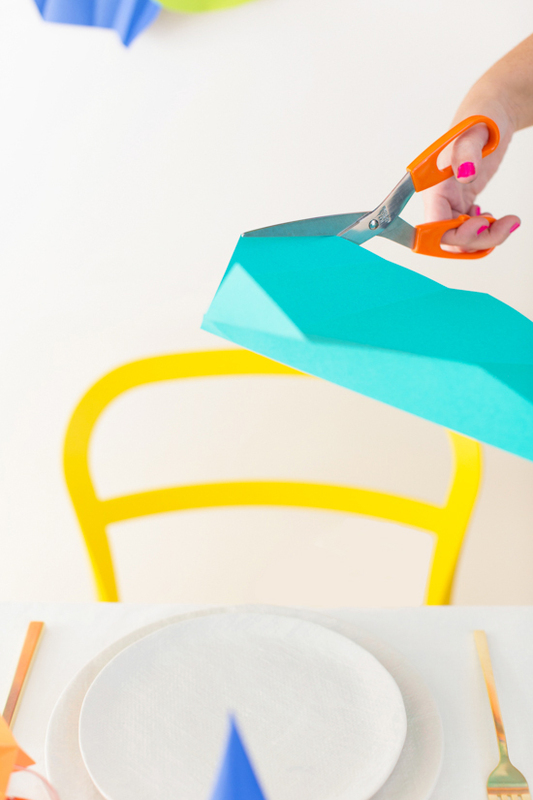 But seriously though, who doesn’t have tape and scissors at their house? 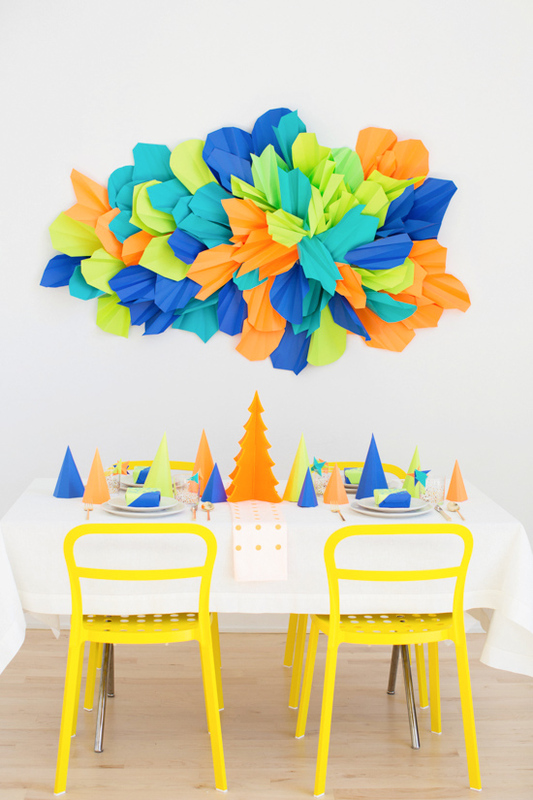 I created a giant wall art piece, that doubles as a photo booth backdrop, using regular 8.5×11 sheets of colored paper. And though it may look complex, it’s really super easy to recreate. In fact, I’m going to make another one for our house in the new year, to keep up as an art piece. 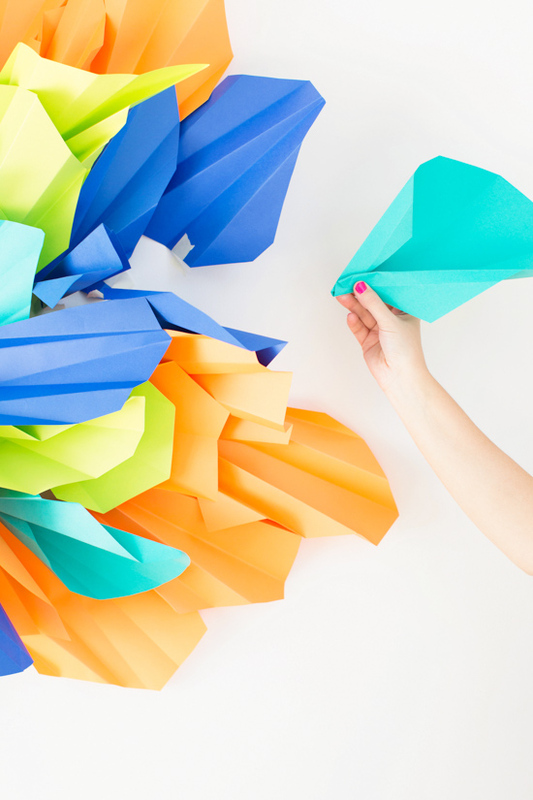 To make your own folded paper wall art, all you do is fold a piece of paper at random, in various directions. I folded every piece a little differently, so no two pieces are exactly the same, kind of like a snowflake. Then cut off a couple of the edges at an angle, so it no longer looks like a rectangular sheet of paper. Then attach to the wall with tape. 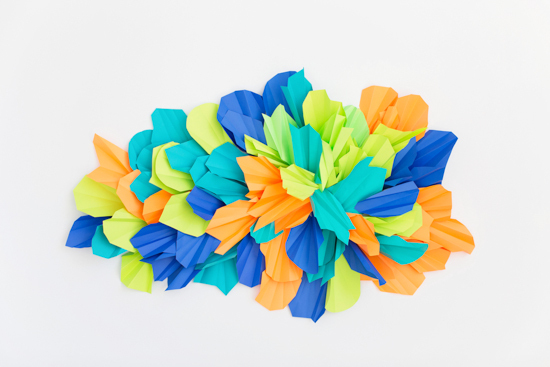 You’ll need quite a few pieces to create a piece that is as large as mine, but it goes by super fast because each piece of paper takes only 30-60 seconds to fold and cut. Instead of drink stirrers, I decided to create drink markers that rest right on the rim of the glass, to save time and the extra expense. 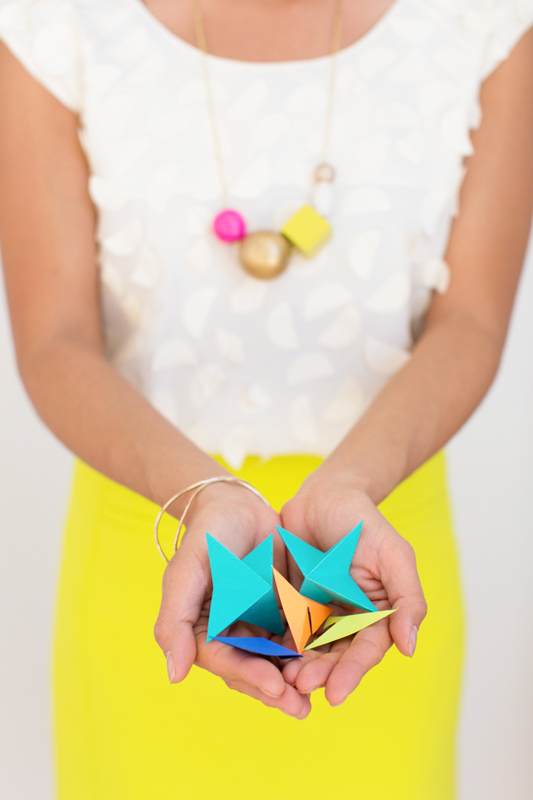 All you have to do to create your own is cut and fold small pieces of paper into different shapes (like a triangle or a four pointed star). Then cut a small slit in the bottom of each shape, that is about an 1/8 of an inch wide. Then rest the shape on the rim of a glass, inserting the rim through the slit. 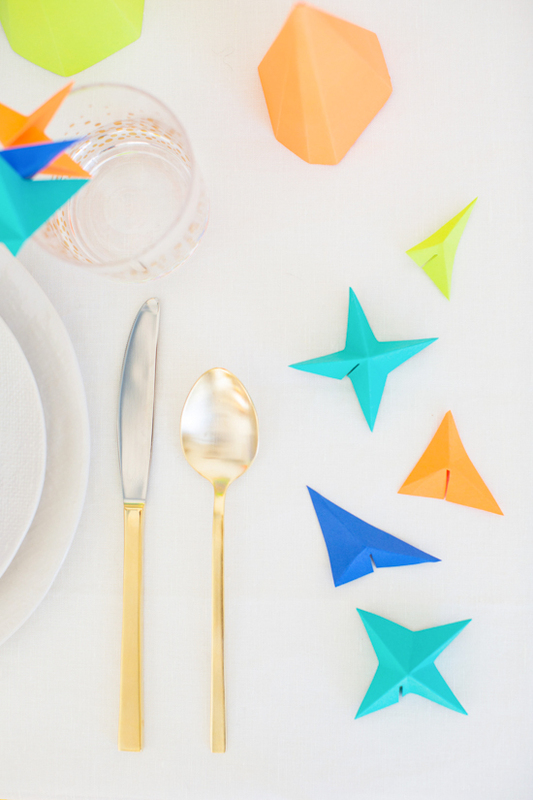 You can write names on each one to claim drinks amongst guests or use a different color and shape combo for each person instead. This was so good. Jeff and I ate our fill of it after the shoot was over. If you like chocolate and minty things, this is a can’t lose situation. Both this recipe and the ice cream sandwich recipe are from Kellogg’s Snacks. Get the recipe here. 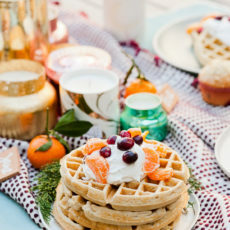 At each place setting, there was a wrapped gift, which works as both a party favor and a place card, if you customize each present with a guest’s name. I just let the patterns take center stage for these though. 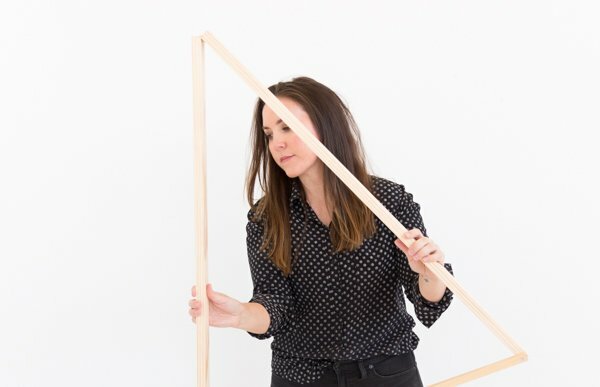 To create the color blocked base, wrap a box in one color, just as you normally would, then wrap a second contrasting color over the first and secure the ends that are covered with tape. 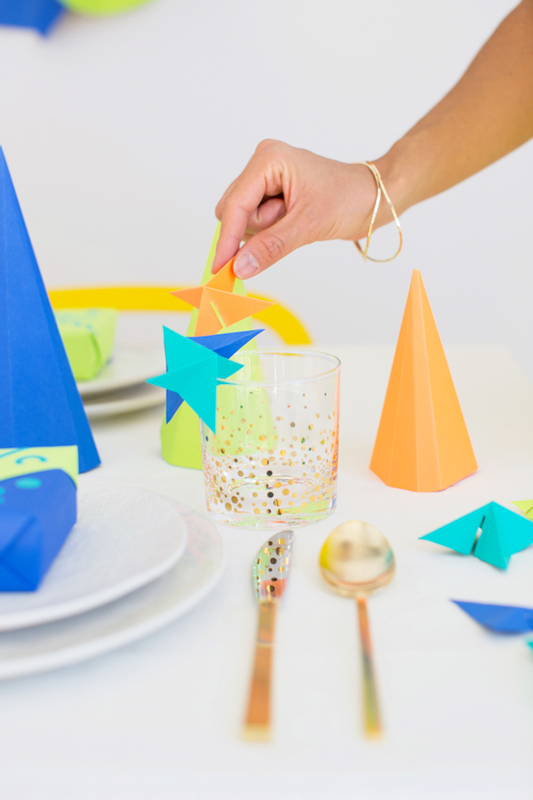 To add the pattern, cut out various shapes from colorful pieces of paper and glue onto of the already wrapped gift. Easy, right? 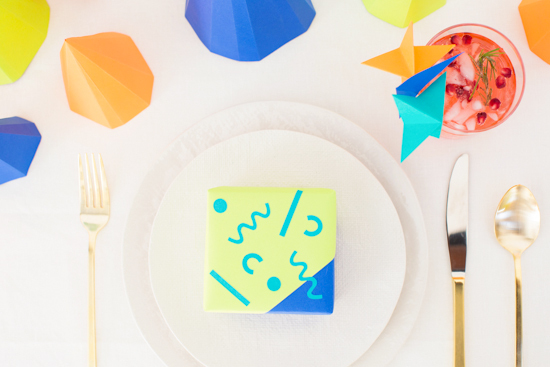 By the way, the pattern I created for these presents was inspired by an old print from the designer behind Dusen Dusen. They should totally make wrapping paper, don’t you think? And ice cream sandwiches! Who doesn’t love those?! 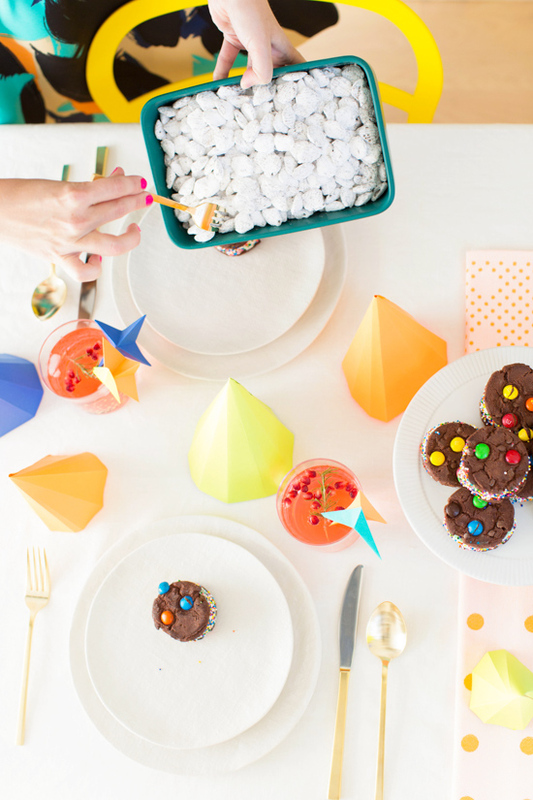 The rainbow sprinkles and M&Ms on the cookies themselves made for a colorful treat to go alongside all of the decor. Get the super quick Kellogg’s Snacks recipe for these ice cream sandwiches here. 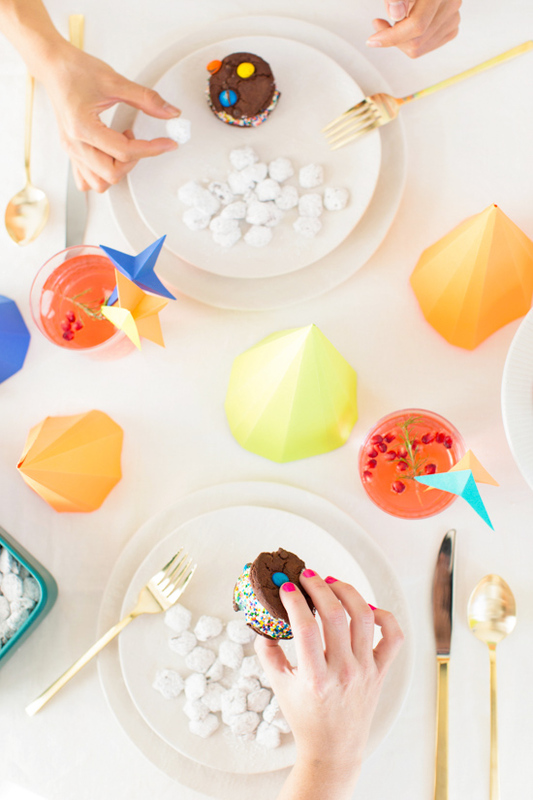 The geo trees on the table were created very similarly to the folded wall art. 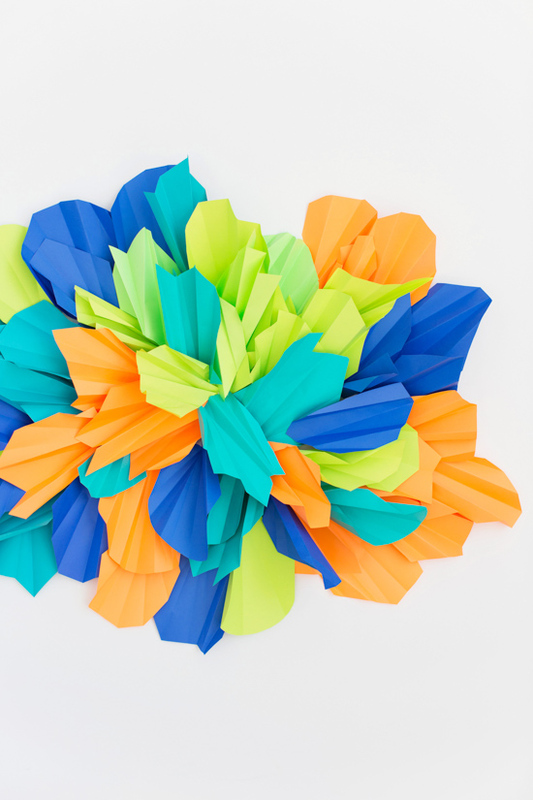 Just fold a piece of paper in various widths, all folded toward one corner of the paper. Then, tape or glue the two ends together and cut off excess at the bottom to create an even bottom for the tree to stand on. 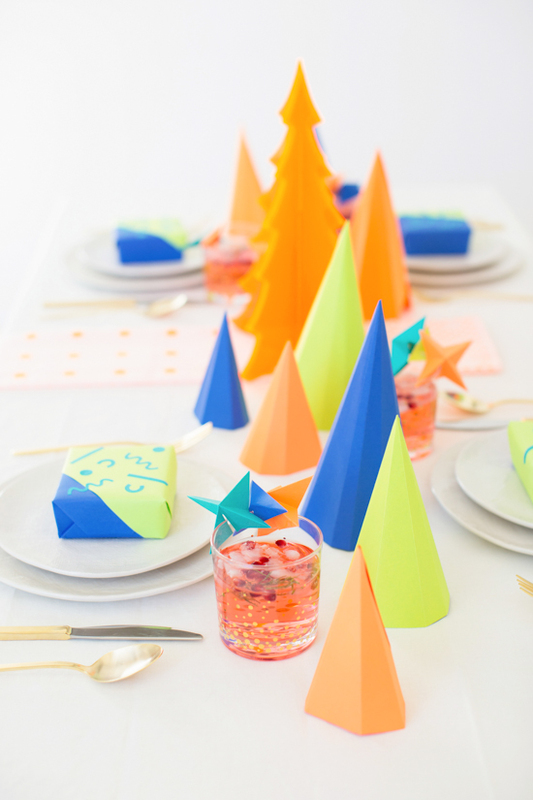 Side Note: Be sure to keep those geo Christmas trees for the new year, because they make great party hats after the Christmas holiday is over. Just attach an elastic string on each side and you’re good to go. 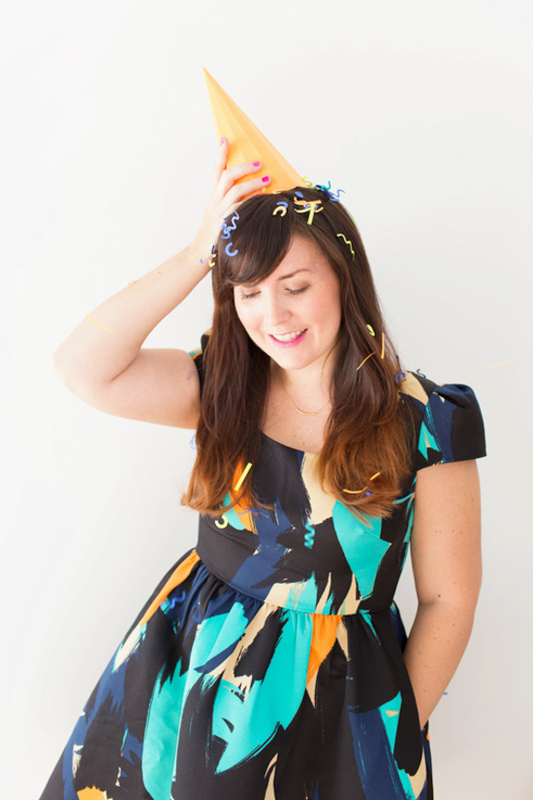 Also, those cut outs from the patterned wrapping paper double as party confetti! Have any ideas for how to colorize your own party, for the holidays and beyond? I’d love to hear your thoughts in the comments below. 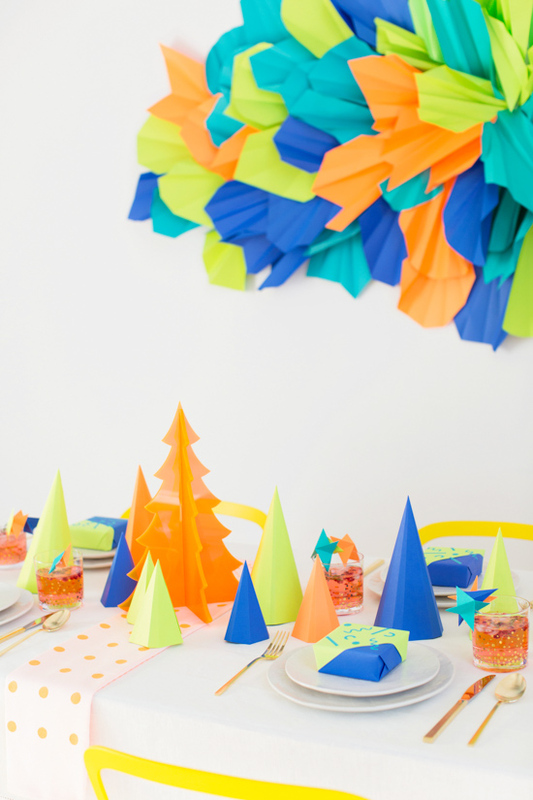 Or share how you bring color to parties with the hashtag #ColorizeYourParty. This post is in partnership with Astrobrights Papers. Thanks for supporting the brands that help keep Paper & Stitch going. This is really bold and vibrant. And gorgeous! Great pictures too!! Squee!! Love it all! It feels tropical and warm. I’m a big fan of non-traditional colors/themes for the holidays.. I’m currently obsessed with mint, black and white for Christmas. 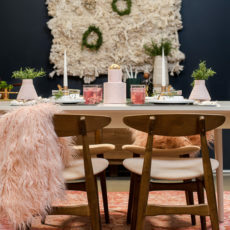 I’ve done several tablescape shoots in this color and our Christmas party will be the finale. Thanks so much, Not Just A Mommy. Mint black and white is a good color scheme too! Glad to hear that Ilia. 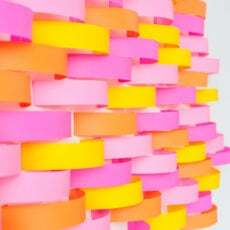 What a awesome idea, such a bold colour choice that works so well! These are all so creative, and I never would’ve thought of that color scheme, but I can see it working amongst my friends. Kudos! Thanks Liza. You should totally give this a try with your friends. SHUTUP. This look so awesome, B!!! The Darby Dish by Darby Smart | Darby Smart Blog! Hi Julie. It’s from Anthropologie.